Missionary Oblates - You're not a good priest unless you get mad once in a while. Home : Store : Projects : MAMI - Prayers : You're not a good priest unless you get mad once in a while. You're not a good priest unless you get mad once in a while. The Missionary Oblates serve the poor and needy in the United States and more than 60 countries around the world. Pope Pius XI referred to us as "Specialists in the most difficult missions." We go to places where people are being neglected and we do something about it. Our actions often require an extensive amount of bravery. The Oblates work on justice issues in areas such as the treatment of migrants, opposition to the death penalty, ending abortion and protection of the environment. Father Norman Comtois, O.M.I. described his ministry as "Evolutionary Christianity." He leads discussions and retreats about eco-spirituality, integrating the natural world with the wisdom of religious traditions. 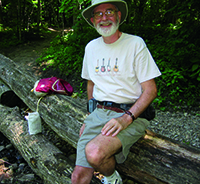 Father Norman is part of the Oblates' La Vista Ecological Center which offers programs and resources for living consciously within the Integrity of Creation. Oblates are standing side by side with indigenous people to protect their land from being taken by logging and mining interests. Some of the indigenous people we are working with are the Garo and Khasi people of Bangladesh, the Aymaras in Bolivia and the Inuits in Canada. Fighting for people who are the most mistreated among us has many rewards, but pay isn't one of them. These people and justice programs of the Oblates need the financial support of friends like you in order to continue. Can you make a gift at this time to bring peace and justice to our most abandoned brothers and sisters? Can you help us help them? I thank you for taking the time to learn about these life-changing ministries of the Missionary Oblates. I also thank you for your prayerful consideration in partnering with these ministries. But most importantly, I thank you for getting mad and doing something about it. The Oblates want to give you the Gift of Prayer. Click here to send your prayer petitions and I will have Oblates from around the world lift up your intentions at Mass and in their prayers.